Who doesn't love a good meatball..(bar the obvious of course)? I use lamb meatballs as an 'in' when it comes to using eggplant in my sauces. For Nic and I it isn't a problem but the boys are totally against it when spotted. I don't hide vegetables, but I will cook them down for maximum flavour.......if this process happens to breakdown the vegetable in question and make it look like part of the tomato sauce then lucky me! My 'best' eater is trying to have a sea change and thinks that it is his right to announce to the world that all things HE doesn't like will kills us all. I can usually ignore the rambling but when it affects the way his little brother looks at food, well, it is something I can't ignore any longer, dammit! I was experimenting with this recipe, as I wanted something that I could serve as an appetiser (so it has to have a punch of flavour) or as a main course. I am pretty happy with the end result but I will need to have a bit more of a fiddle until I am completely satisfied. If you're at all tempted to give it a try then please go ahead and let me know what you think......I am always open for ideas and suggestions. Just in case you're wondering, the boys ate it all up. Max did spot a piece of eggplant that still held onto its shape but Alex had already finished by this time so I didn't have to snap his head off when it came to letting the cat out of the bag so happy days! 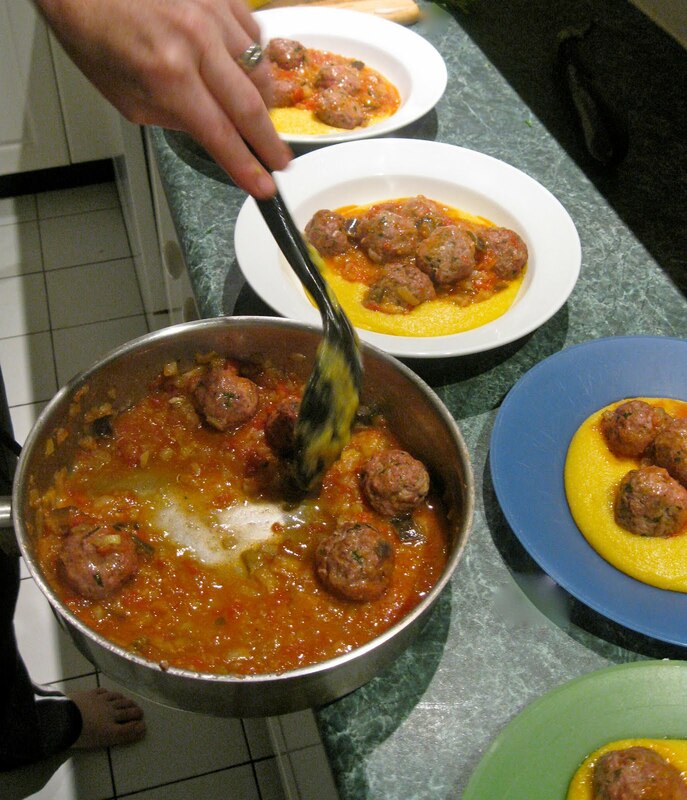 When preparing the meat balls, place all the ingredients into a medium bowl and mix until well blended. Roll into small balls then place on a greased baking tray leaving a little space between each ball. Bake in oven for ten minutes. For the sauce heat oil in a large saucepan over medium high heat..
Add onion and garlic, then saute until soft. Add eggplant, fennel, salt and pepper and stir to combine. You will need to stir occasionally so they eggplant softens evenly (aprox. 8 minutes). Add diced tomato and vinegar, stir to combine. Once boiling, turn down you heat so your sauce simmers for about 10 minutes, stirring occasionally with a lid on. Add 1/3 to 2/3 cup of stock (depending on how running you like your sauce) and your meatballs and simmer for a further 10 minutes. Looks like we're both leaning Greek this past week! Just a thought--how about adding some ground cumin and coriander to the meat mixture? Maybe a squeeze of lemon? They look great! These look/sound great Camilla. The meatballs and sauce both sound wonderful! Your right TKW, cumin would be great, I'll pop it in on my next round- cheers! Ground lamb-yum! I love the ingredients you used. Cinnamon and coriander taste heavenly with lamb.